Sacraments are outward signs of your inner faith. As Jesus was Baptized in the river Jordan, we are all similarly welcomed into the Christian community. As we grow and age, different sacraments become meaningful and relevant. Read below about the various moments in life that you can sacredly declare your faith within our community. 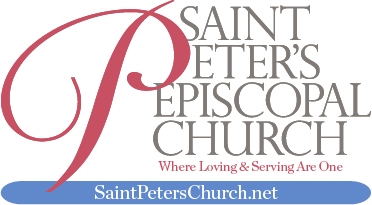 Become a member of Saint Peter’s. Baptism is the first holy sacrament that most of us receive. It marks our incorporation into the Body of Christ, our reception of the gift of the Holy Spirit, and our commitment to be nurtured in our faith in a community of believers. Baptisms at St. Peter’s generally takes place on the following days: Easter Vigil, Pentecost, All Saints’ Day (or on the Sunday after All Saints’ Day) and on the Feast of the Baptism of our Lord. Baptisms may also be carried out by the Bishop, at his/her Visitation. Adults interested in baptism, and parents who wish to have their children baptized, should attend church regularly and attend a baptism preparation class prior to the service of Holy Baptism. Confirmation is the mature affirmation of one’s Christian faith and commitment to the Church. When baptized children mature and wish to be confirmed, they are expected to prepare themselves for confirmation by taking classes given by the church. Baptized adults (unless baptized by the Bishop) are also expected to prepare for confirmation by taking classes prior to the laying on of hands by the Bishop. Reception occurs as part of the Confirmation Service. One may be “received” into the Episcopal Church if one has been confirmed in another denomination, usually by a bishop in the Roman Catholic, Orthodox or Lutheran church. Reaffirmation occurs as part of the Confirmation Service at the time of the Bishop’s Visitation. It is for those who want to renew their commitment made at confirmation earlier in their lives, or for those who have had a powerful experience of faith and want to celebrate it. Confirmation, Reception and Reaffirmation all take place in a Confirmation Service. Those wishing to be confirmed, received, or reaffirmed in anticipation of the Bishop’s upcoming visitation are required to have prior consultation with the priest. Marriage is the blessing of the solemn and public covenant of two individuals making a commitment to each other to have a lifelong monogamous relationship in the presence of God. Upon completion of pre-marital counseling, the clergy will officiate the sacrament of marriage for all active members of our church, their relatives or active parishioners of other Episcopal parishes. As the beautiful stained glass windows and Victorian architecture of our sanctuary offer an ideal setting for a wedding, we make our sanctuary available for weddings to non-members as well. The Eucharist, the sharing of bread and wine – the body and blood of Christ, is central to our communal worship. It is observed both as a memorial as in “Do this in remembrance of me’, and as a celebration of the life to come in the kingdom of God. The sacrament of Eucharist binds us participants horizontally to each other and binds us to Jesus and so to God vertically. The liturgical prayer we use is Rite 2 from the Book of Common Prayer.